The Spin R1 is a classic designed bike made for the home and based on the gym style bikes from Spinner. This is recently released bike from the company that originally developed the spin bike. It is a no frills bike with the standard features of a spin bike including a heavy flywheel at the front to provide a similar riding experience to rolling down the road on a road bike. A bike for the home needs to provide a good workout of course but also needs to be able to fit in to everyday life without becoming a burden, otherwise it can end up just being another place to hang your clothes on to dry or something worse. It is an affordably priced bike making it a good option for beginners and those looking for cardio and low impact workouts in the home. Even at this price it is important that you can get a good workout from it and for a number of years too. The steel tube frame is solidly made and holds you steady when you’re riding in and out of the saddle and transitioning in between. You can just get on with your exercising without worrying about any wobbling or shaking. It has been coated with a blue powder coat that looks good and is rust resistant to keep it looking good and working well for a number of years. The flywheel is 31 lbs and perimeter weighted giving it more inertia to full the pedals all the way round the 360 degrees to promote a good pedal stroke. This helps with form, makes it easier to stand out of the saddle and reduces impact on the joints. It is not going to provide the inertia or fluidity that you get with heavier flywheels but as a rule they are only available on more expensive bikes (see Spinner Aero) which can be used by beginners as well as more experienced riders. Underneath the stabilizers are 4 levelers that are used to balance up the bike when being used on uneven floors to prevent it rocking from side to side. The bike is designed to accommodate riders between 4 ft 10 ins and 5 ft 10 ins. The seat can be adjusted vertically and horizontally and the handlebars vertically to get the bike to fit comfortably and properly. To change the size settings for the bike is quick and easy to do. You loosen pop-pin and pull it and then slide the handlebars or seat to the position you want and then release the pop pin into the nearest pre-set hole and then tighten up. The pre-set holes do provide a little bit of restriction as you can’t set it to exactly where you want so it may feel a little uncomfortable. However , it does mean that the seat and handlebars are unlikely to slip due to the pop pin holding them in place even if not fully tightened in error. The speed of the adjustment means that it can be used by a number of users of different heights for their low impact workouts which makes it a great machine for all the family to work on their fitness. The resistance works with a friction pad that sits on top of the flywheel. To increase/decrease the resistance you turn the resistance knob at the front of the bike. It provides a consistent level of resistance to avoid any slipping as you pedal. The increase/decrease goes up on continuous scale from easy to very hard. It may take a little getting used to determine how far to turn to get the resistance you want as it can feel different to a bike in a gym. Also there are no markings to give you guidance as to where you’ve turned the resistance up or down to. This makes it more difficult to set it objectively especially when wanting to return to a previous setting which you can only do by feel and estimation. 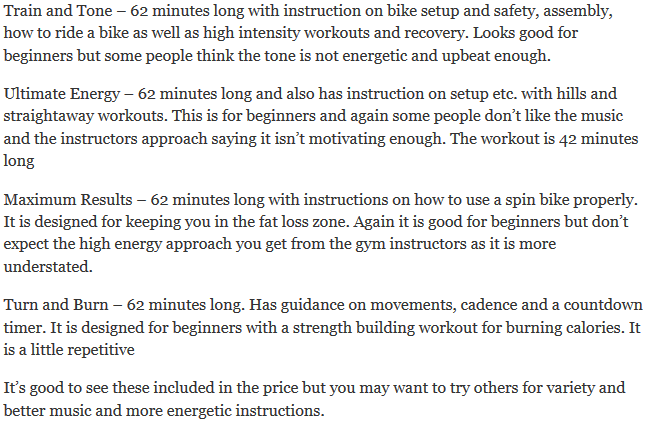 This is how most spin bikes work and it is only bikes that cost a lot more that you get any sort of guidance on resistance levels set. There is no guard to protect the resistance pad and flywheel from sweat. It is likely that sweat will drip on to the pad and flywheel which over time will damage them. It is important to keep the flywheel clean to keep it and the pad working optimally. Better bikes (and more expensive) have a guard which helps to prolong the life of the pad. The pad does wear down and need replacing but you should get many months of use from it before it needs replacing. The manual has instructions on how to do this and also where you can get replacements from. The bike has a chain drive which is the same as you’d find on a road bike. This helps to give a similar riding and pedaling sensation. It is encased in a guard that helps to prevent dust and sweat affecting it and also prevents you bashing your ankles on it or your clothes getting caught in it. While you get the same feel as an outdoor bike you also get the same maintenance issues too. You’ll need to lubricate the chain and adjust the tension of the chain from time to time. It is required less often than an outdoor bike. It is straightforward to do and well explained in the owner’s manual. It has a direct drive or fixed gear so there is no ability to coast. When the flywheel is turning so do the pedals. The flywheel continues to turn after you’ve stopped pedaling due to the inertia it has built up. To stop the flywheel and pedals you can either push back gently on the pedals or push down hard on the resistance knob which acts like a brake. The pedals come with toe cages for athletic shoes. There are no straps to adjust to tighten the grip on your shoes. They do not fit specialist shoes. The Q factor is a very good 155 mm which is the horizontal distance between the pedals. This is a little wider than on most bikes but is amongst the best for indoor cycles and spin bikes. This narrow Q Factor helps to keep the legs more in alignment which prevents putting unnecessary strain on the joints which can lead to injury. It feels more natural too like you have on a road bike. Noise. The bike won’t make too much noise but it isn’t silent. You’ll hear the chain moving across the sprockets and also the pad rubbing on the flywheel. The level of noise it similar to an outdoor bike so is unlikely to disturb others in the house. You may need to turn the TV up a little bit to hear it clearly. If noise is going to be an issue you could look at the Sunny Health and Fitness Belt Drive which about $70 less than this model but doesn’t come with workout DVDs. There is also less maintenance and mess to deal with a belt drive. Dirt and Dust. It won’t give off a lot of dust and dirt but there will be some. It is going to come from the chain drive dropping oil and the dust from the resistance pad as it wears down. However, the biggest problem is likely to be sweat. To keep the bike in good working order it is important totclean the bike regularly. It is likely this will drop on floor and to protect it a rubber exercise mat is a good idea. Handlebars. The bars have a rubberized coating to make them easier to grip and prevent blisters when your hands get sweaty. They are designed to cater for all the standard indoor cycling/spinning positions but they don’t have aero bars in the center or drop bars for cycling training. This is a compact bike making it easier for storage and use in homes of all sizes including apartments. When not in use it only requires an area of 18 inches by 44 inches. It can be stored in large cupboards or under the stairs etc. If you don’t have somewhere specifically it is a reasonable looking piece of exercise equipment so won’t be an eyesore if you have to keep it out or against a wall. It does weigh 92 lbs which on its own would make it difficult to move in and out of storage. Fortunately it has 2 small transport wheels at the front that you tip the bike onto when you want to move it. You can than easily wheel it to where you want it to go. They are completely exposed and wheel freely so shouldn’t jam even on carpet (except if you’ve got a very deep pile). They’ll work best on hard surfaces. If you’ve a wood floor you may find the wheels may scratch or dent it so it pays to check that first before you move it all the way across your beautiful wood floor. The bike comes part assembled for shipping. You are required to complete the assembly. It normally takes less than an hour. Often people find the most difficult part, due to the weight of the bike, is moving the package to where you want to assemble it. This is followed by holding int in place while the stabilizer bars are attached. For this reason you may want 2 of you to complete the job. There are less parts and screws than you’d find with a typical kit set furniture. The frame and flywheel are already assembled when you receive it. The seat, poles, stabilizer bars, pedals and handlebars need to attached to the bike frame to complete the job. The tools required for the job are included. The assembly instructions are basic but sufficient to complete what is a straightforward job. The bike doesn’t include a console. This is not unusual for spin bikes with many people using the music of a workout or their own estimate to determine how fast and how hard to push themselves. This is something many people are happy with. If, like me you want some information such as RPM and speed etc to help you stay on track during a workout and plot progress then it is possible to attach a standard bike computer to the bike such as those made by Cateye. However, you do need to modify it to attach it to the bike and in particular when attaching the spoke magnet to the flywheel. Although there isn’t much in the way of accessories that come with the bike it is more than most bikes. It comes with a water bottle holder and 4 workout DVDs. The water bottle holder is a metal clip that is positioned on the frame which does put it in easy reach but also may get a lot of sweat dropping on bottle too. You do need to make sure you don’t kick it with your foot when getting on and off the bike. As the bike has only been recently released there isn’t many customer reviews to see how it is standing up to real world use. Reviews for other Spinner models are on the whole positive being impressed with the qaulity and there is nothing to suggest that this bike will be any different. The one customer review that has been left says it was good value for money and were pleasantly surprised at the quality of the manufacture. For the price you get a good quality bike from the company that is known for their spin bikes and they take it seriously and stand behind them. When I checked on Amazon it qualified for free shipping. This is a great bike for beginners or those looking only for moderate amounts of exercise and is not really for those looking for serious amounts of training and intensity. The 31 lbs flywheel is likely to be too light for experienced spinners looking to workout from home. It is affordably priced that is sturdy and can give a good workout. It is durable so you can get good use out of it for a number of years. It would be better if it had a basic computer to help with keeping on track and monitoring progress. Also a horizontal adjustment on handlebars would help in making it easier to adjust for more different shapes and sizes. The inclusion of 4 workout DVDs is great for people wanting to get started with good instruction on setting the bike up along 4 different workouts. It is good value for the price with being well made and solid.